Kvass or kvas, sometimes called in English a bread drink, is a fermented beverage made from black rye or rye bread (which contributes to its light or dark colour). By the content of alcohol resulted from fermentation, it is classified as non-alcoholic: up to 1.2% of alcohol, according to the standard of Russia. It is popular in Russia, Belarus, Ukraine, Lithuania, Poland, and other Eastern and Central European countries as well as in all ex-Soviet states, like Uzbekistan, where one can see many kvass vendors in the streets. Kvass has been a common drink in Eastern Europe since ancient times. It was first mentioned in Old Russian Chronicles in the year 989. In Russia, under Peter the Great, it was the most common non-alcoholic drink in every class of society. Later, in the 19th century, it was reported to be consumed in excess by peasants, low-class citizens, and monks; it was, it is sometimes said, usual for them to drink more kvass than water. It has been both a commercial product and homemade. It used to be consumed widely in most Slavic countries, where in almost every city there are kvass vendors on the street. Today it forms the basis of a multimillion-dollar industry. 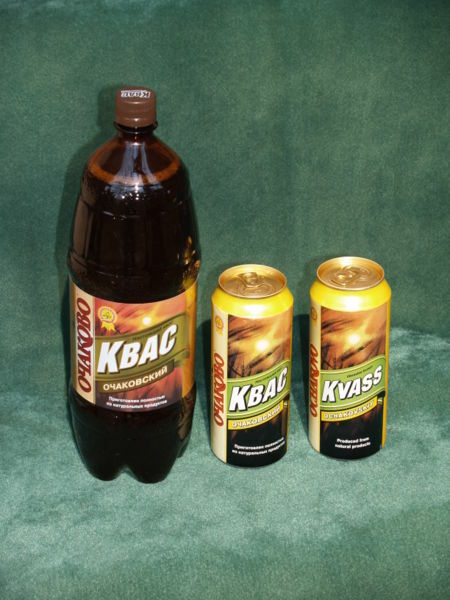 Kvass was once sold during the summer only, but is now produced, packaged, and sold year-round. 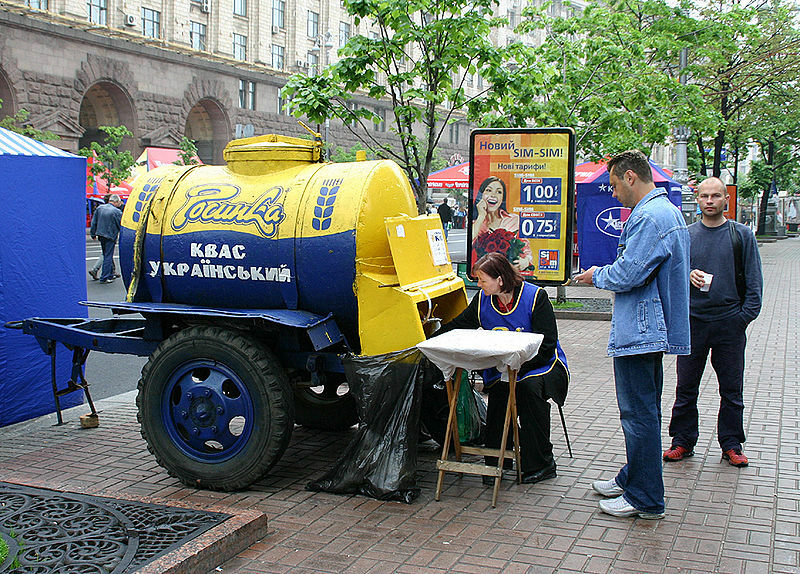 Left: A kvass street vendor in Kiev (2005). Kvass is made by the natural fermentation of bread made from wheat, rye, or barley, and sometimes flavoured with fruit, berries, raisins or birch sap collected in the early spring. Modern homemade kvass most often uses black or rye bread, usually dried, baked into croutons (called suhari), or fried, with the addition of sugar or fruit (e.g. apples or raisins), and with a yeast culture and zakvaska ("kvass fermentation starter"). 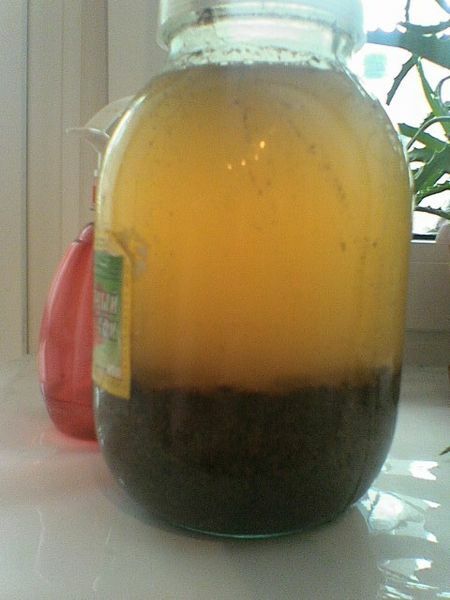 Left: Kvass being fermented in a jar. Kvass is commonly served unfiltered, with the yeast still in it, which adds to its unique flavour as well as its high vitamin B content. The alcohol content is so low (0.05% - 1.44%) that it is considered acceptable for consumption by children. It is often flavoured with fruits or herbs such as strawberries or mint. 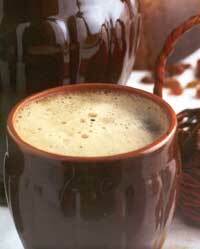 Kvass is also used for preparing a cold summertime soup called okroshka. Recently, the development of new technologies for storage and distribution, and heavy advertising, have contributed to this drink's surge in popularity. Even Coca-Cola launched its own brand of kvass in May 2008.